Selling your home can be a challenging period in your life. You never know how long a property will take to sell, and showings and open houses can take a lot of work. But what’s even more nerve-wracking than the sales process? Waiting for an offer on your house! And when the offer arrives, you have to decide whether you’re going to accept it. Talk about a big decision! Do you absolutely have to sell? If you have a job in another country, it starts in a week, and you need to go now, you may not have the luxury of negotiating multiple offers! Consider your timetable when you think about whether or not to accept an offer on your home. After all, you never know when another offer will come along. Is the offer appealing in some way? An all-cash offer, for example, may appeal to you more because you can be assured that your buyer will make it to the closing table. Likewise, buyers who are pre-approved, or those who write offer letters that appeal to your heartstrings…these are things you’ll want to consider when it comes to accepting an offer. Do you need to move on? Some tough situations, like the death of a family member or a divorce, may have you wishing you could simply pack up and leave. If you’re in a rough situation, you’ll want to take that into account as you receive offers. You may be better off leaving the home behind – even if it means losing out on a bit of money. How quickly did you receive the offer? If your home has been on the market for all of an hour and you’ve already received several qualified offers, you may have the luxury of waiting for additional offers or negotiating with buyers. However, if your home has been on the market for a few months and you’re just now receiving your first offer, that’s worth thinking about. Are there any issues that might make your home harder to sell? If you know your home needs some work, but you’re not willing to put the time or money into doing it yourself, you should consider offers more seriously. Even if your home is fairly priced, buyers may look at the work that needs to be done with a critical eye. 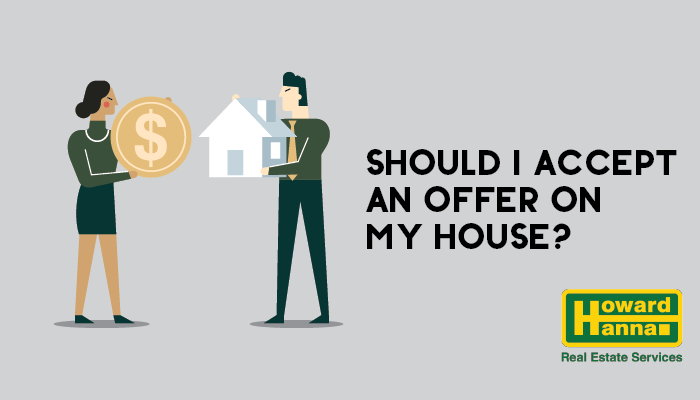 So, take this into consideration when deciding whether you’re going to accept an offer on your home. What does your real estate agent think? While the decision is ultimately your own, your real estate agent is a great guide to help you decide whether or not to accept an offer! They’re the experts in understanding your neighborhood and its market, so lean on their knowledge when determining whether or not to sign a purchase agreement.